The Pinnacle March is your first look at the Grove City Marching Band in full array. It is a wonderful event, where, for the first time, you see your student marching in full contest uniform across the Pinnacle golf course. It is an event that brings tears to the eyes of almost everyone who views it. on August 22, 2019 at 7:00pm. What is the Pinnacle March? This is an annual event, now in its sixth year, which takes place at the Pinnacle Golf Club. 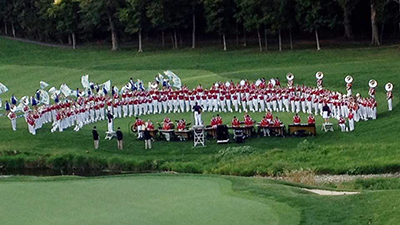 The band will march across the golf course to the ninth green, where they will stop and perform for the audience on the hill, that has been anxiously waiting to hear them. You will need to bring your own seating; blankets or lawn chairs. The Pinnacle will be providing a cash-only concession stand. No coolers are allowed. Students are selling the $5.00 tickets during pre-band camp (July 29 - August 2, 2019). So find a band student! Tickets are also available at the door at the Pinnacle Golf Club the night of the event. Assistance is available for those who are disabled. If all disabled parking spots are taken. We will have a golf cart for transport from the back parking lots up to the entrance of Cimi's Bistro. This is a fun evening at a very reasonable ticket cost of $5.